Following the 2017 Góbéfest: GoBeArt Panel, in March 2018 and in partnership with a-n the Artists Information Company and the New Generation Centre, Castlefield Gallery supported eight contemporary visual artists and one writer all living and working in the North West of England, to undertake an Artist International Delegation to Budapest, via Munich. The delegation travelled by train using the journey as a short-burst residency to learn more about contemporary and historical Europe. The group’s visit in Budapest focused on visiting and connecting with galleries and artist-run projects, in particular to share learning and bring knowledge back to the UK on how artists respond to, and are able to navigate sudden political and social shifts that directly impact how and where they are able to work. Hear about the delegation’s experiences from Castlefield Gallery’s Jane Lawson and participant Lucy Harvey. Hear from an expert panel of artists, arts and cultural leaders, funders, and policy-makers about their experiences and perspectives on delivering international exchange programmes. Learn about the benefits of international exchange, challenges, sustainable approaches and models, as well as what is involved in establishing meaningful international collaborations. Róbert GRÜMAN is a public policy expert from Transylvania with a strong background in public administration, campaign management, tourism, entrepreneurship and NGOs. Passionate about working with intercultural teams, analysing any problem and developing solutions. Strong in training, team work, leadership and organisational skills. Róbert currently acts as elected Vice President of Covasna County Council and also as the Vice President of the Congress of Council of Europe. He is also a freelance trainer and consultant in international training courses founded by the European Commission through the Youth In Action and Erasmus+ programs. In the last 10 years he has been a volunteer, founder and leader in different NGO’s, this experience he considers a second university, as it developed his problem solving, project management and leadership competences, skills that cannot be learned in the formal education system. Visual Artist and Filmmaker living and working in Manchester, studio holder at Rogue Artists’ Studios and a participant in the joint Castlefield Gallery / a-n Artist International Delegation to Budapest / Munich in March 2018. Allan was an Erasmus Mundus scholar on the DocNomads MA programme hosted in Portugal (Universidade Lusófona), Hungary (SZFE University of Theatre & Film Arts) and Belgium (Sint-Lukas School of Art). He is currently working with peers from DocNomads to develop the CineCaravan, a travelling programme of work from Hungarian and international artists focusing on frontiers, human movement, and transnational identity that will be screened in Hungary and the UK. Steph currently works as Culture Manager for Creative Europe Desk UK, a partnership organisation which exists to promote Creative Europe in the UK and supports the UK’s creative and cultural sector to access this EU funding. Steph has a background in music, starting with a Manchester based record label nearly 15 years ago. She has been involved in a number of international collaborative music projects both as a performer and project manager, and previously worked as a music relationship manager for Arts Council England. With over 20 years’ experience in the Manchester creative industries Tom works for social enterprise SharpFutures, responsible for delivering PR, graphic design, events, online and social media for production facilities The Sharp Project and Space Studios Manchester as well as developing apprentice talent across a range of creative digital skillsets. Previous to these roles Tom has worked for organisations such as the international music convention In The City, Factory Records and NOISE Festival as well being involved in the development of Manchester’s urban youth station Unity Radio, is part of team that delivers one of the world’s most successful code club Manchester CoderDojo as well as maintaining a keen interest in the music, creative and wider arts scenes, both locally and internationally. Programmed by Beat Bazaar Projects & New Generation Centre in collaboration with Castlefield Gallery to coincide with Góbéfest 2018. The New Generation Centre UK launched in February, 2016 within the framework of the Hungarian National Talent Programme. The London based project’s mission is to support students and young professionals in their career development and to build up a strong professional community. The not-for-profit initiative organises cross-disciplinary, wide ranging programmes including conferences, talks, workshops and training. Castlefield Gallery was established by artists in 1984, and is the first public contemporary visual art gallery to have opened in Manchester. The organisation delivers a programme of exhibitions, projects and events from its main gallery in central Manchester, whilst also commissioning, curating and producing off-site and public art, national and international artist residencies, and exchange programmes. Castlefield Gallery is an artist focused organisation, committed to supporting artistic and career development for visual artists, and operates a 200+ strong artist, curator and writer Castlefield Gallery Associates professional development programme, membership also enabling access to New Art Spaces, pop-up art and production spaces located across Greater Manchester. Castlefield Gallery’s international programme facilitates international exchange to export art being produced in the North West of England and enable meaningful relationships between artists nationally and internationally to flourish over extended periods of time. Castlefield Gallery’s Artist Patron is Ryan Gander, OBE. Castlelfield Gallery is a registered charity, a National Portfolio Organisation of Arts Council England and Manchester City Council Cultural Partner. 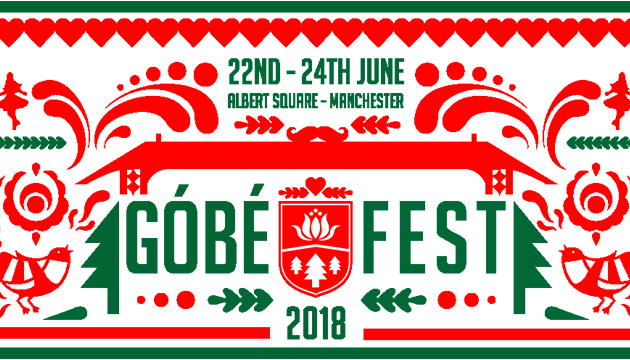 Góbéfest The UK’s only Transylvanian & Szekler Hungarian festival of arts and culture, Góbéfest, returns to Manchester from Friday 22-Sunday 24 June 2018.